Product Deatails - Ingredients- Meat and Rice , Nutritionally,complete,No artificial colours and flavours,Highest factory standards, Quality ingredients, Suitable- Adult Dogs, Quantity -16 Kg. 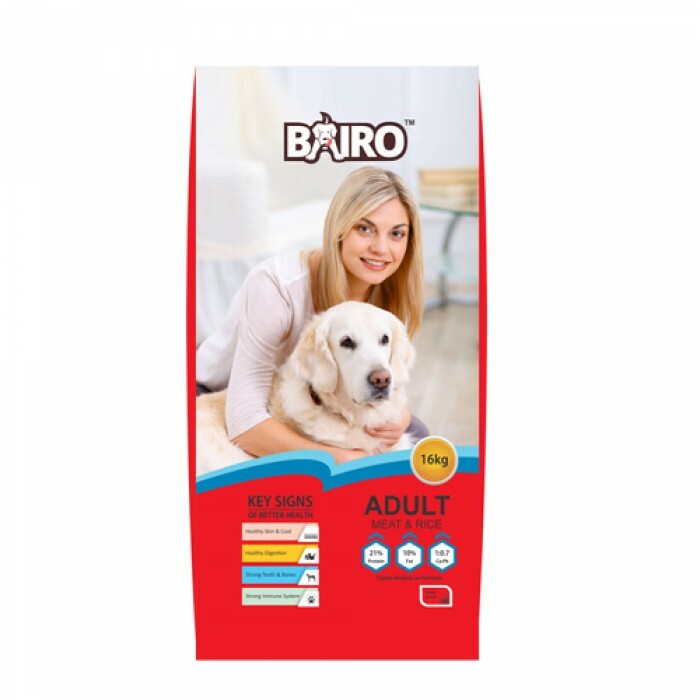 Product Information-Bairo Adult Meat and Rice is a Scientifically formulated to meet the specific requirements of Adult Dogs. Bairo Adult meal has right combination of animal based protein (including premium chicken meal),plus the right combination of cereals ,vegetables ,chicken fat and eggs ,vegetable oils added Vitamins and minerals.It Provides an excellent balance of nutrition to help ensure a naturally long and healthy life for your pet.Composition - Protein - 21%,Fats-10% ,Moisture(Max)-10%,Fibre (Max)-4.5%.